In late July 2010, flooding caused by heavy monsoon rains began in several regions of Pakistan. By August, the floods had affected about one-fifth of the country, including the Khyber Pakhtunkhwa, Sindh, Punjab and parts of Baluchistan, said the Associated Press. Tens of thousands of villages had been flooded, more than 1,500 people had been killed, and millions were left homeless. The floodwaters were not expected to fully recede before late August. This image pair of the affected region was acquired by the nadir (vertical-viewing) camera on the Multi-angle Imaging SpectroRadiometer (MISR) instrument aboard NASA’s Terra spacecraft. The top image is from August 11, 2010, and the lower image is from August 8, 2009. These false-color views display the near-infrared, red, and green bands of the instrument as red, green, and blue. This distinctly highlights the contrast between the water and vegetation on the river banks, because vegetation appears bright red. Water is apparent in shades of blue and cyan, though sediment content can add a tan color, as in the upper right. Clouds appear white. The region of southern Pakistan shown here includes the Sindh Province. The Indus River snakes across the images from lower left to upper right. 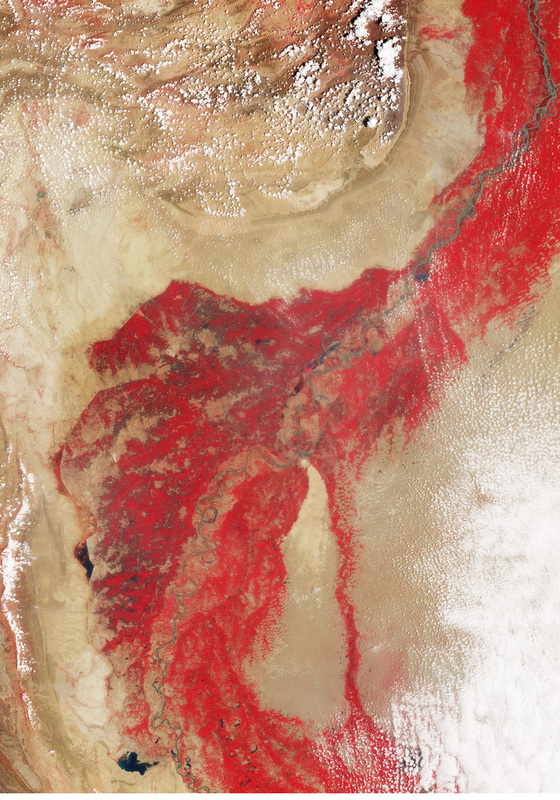 In the image from 2009, the Indus is typically about 1 kilometer (0.6 mile) wide. 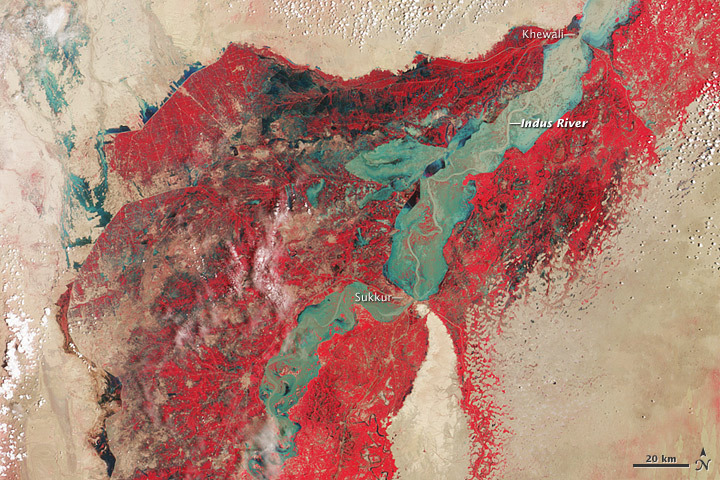 In the 2010 image, the river is 23 kilometers (14 miles) wide or more in spots, and flooding in much of the surrounding region, particularly in the Larkana District to the west of the river, is very evident. 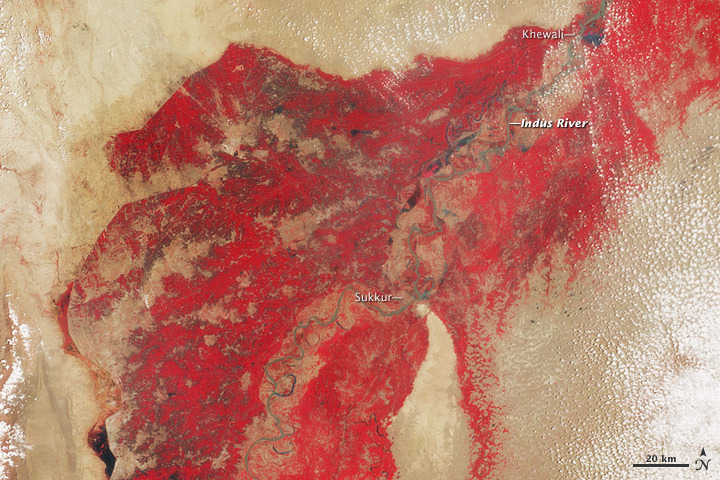 These false-color image show flooding in the Sindh Province of Pakistan on August 11, 2010.